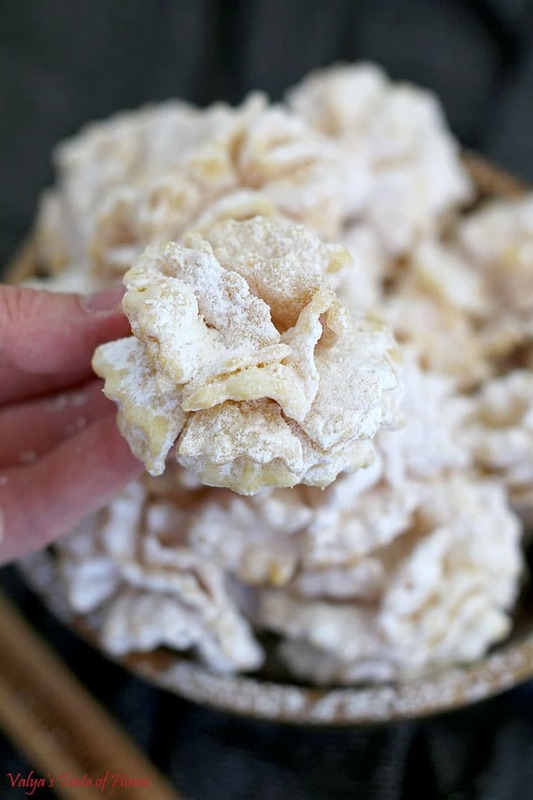 These Pom-Pom Cookies, traditionally known as “Hvorost” in Russian or “Hrustiki” in Ukraine. They are not only easy and delicious but also make a gorgeous dessert décor! I posted a picture on Instagram a while back and promised to post the recipe as well. There is plenty to celebrate in the near future. 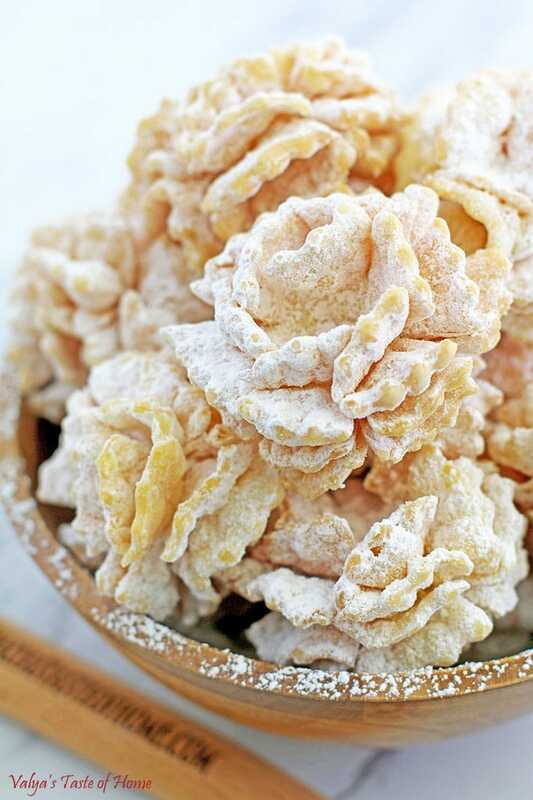 Since Mother’s Day is just around the corner, I really want to post this recipe. Graduation is also upon us, and what better to say “Let’s celebrate!” than party pom-poms? They make a perfect dessert for just about any occasion: holiday, birthday party, wedding, baby or bridal shower. If you have kids, have them help. 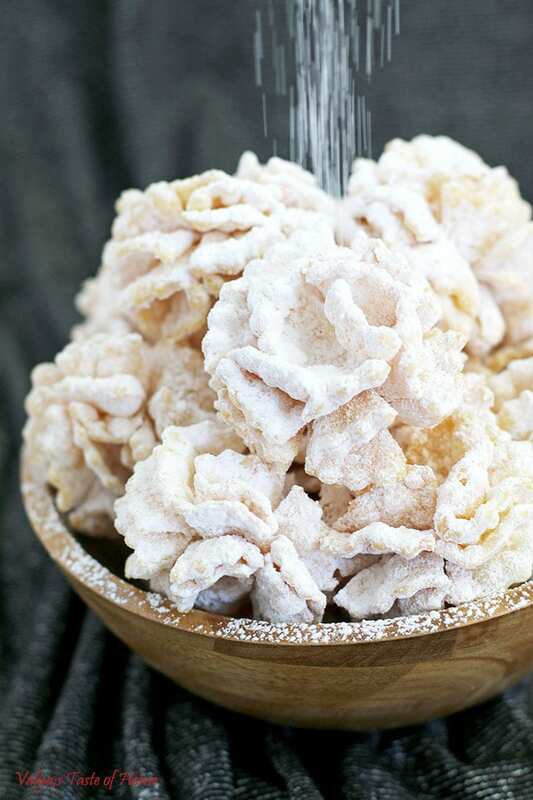 They will love putting them together and drenching them in powdered sugar after cooking. They are a blast, from making to eating. Enjoy! 1. Measure out and sift dry ingredients: flour, baking powder, and salt into a medium bowl. 2. Beat eggs in a separate small bowl with a hand mixer on low for a minute or just until egg yolks combined with whites. Stir in vanilla extract. 3. Add eggs to flour mixture and mix together with a silicon spatula. Dust work surface with flour and transfer the dough. 4. Knead the dough into a ball, place into a bowl, cover with a lid and refrigerate the for 30 min to allow it to rest. 1. 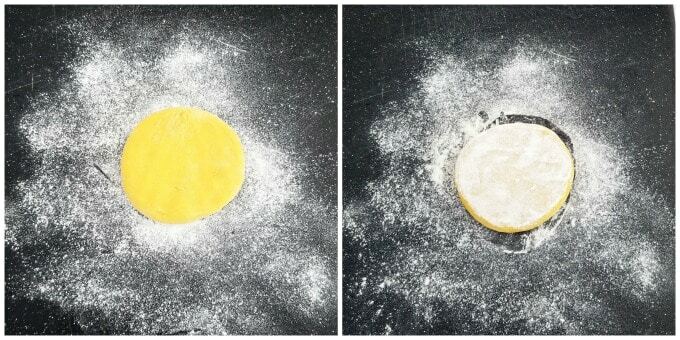 Split the dough ball in half for easier rolling. Place chilled dough onto a working space dusted with flour. 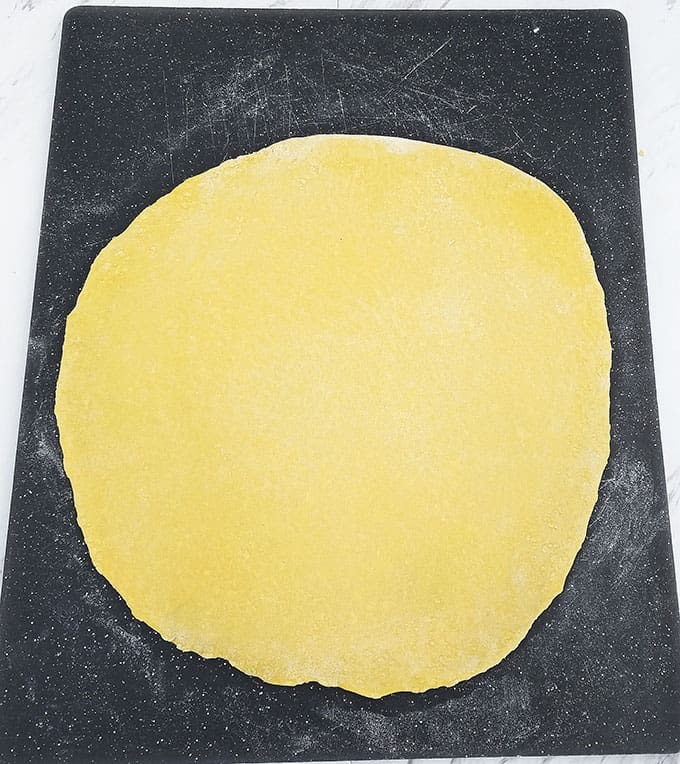 Flatten the dough into a disk and coat with flour. 2. Roll the dough out working from the center out, coating with flour as necessary, until almost paper thin. 3. Cut out cookies with the dough cutters. 4. Separate the cutouts from the remaining dough. Knead the excess dough into a ball and let it rest in the fridge again. 5. Line cutouts in rows of 5 pieces. 6. Dip a fingertip into water and tap the center of 4 cutouts. 7. Stack them on top of each other so that a dry side is over a wet side, ending with a dry side on the top. 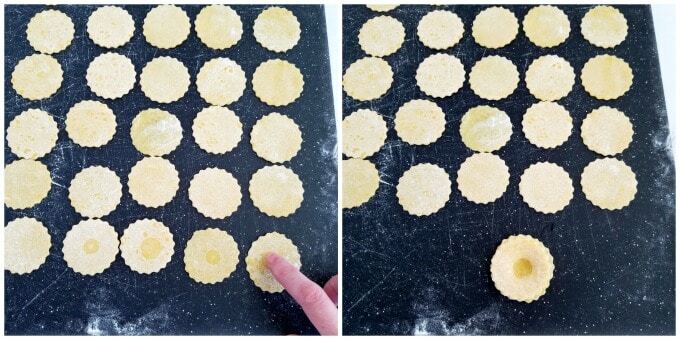 Then firmly press down on the middle a finger (creating a small dip), to seal them together well. Repeat these instructions with the rest of the cutouts. 8. 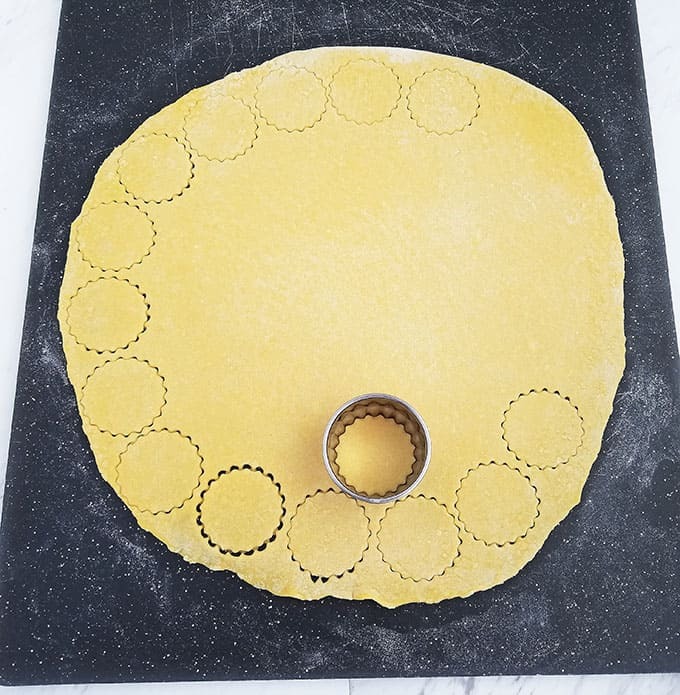 Using a pair of clean kitchen scissors, make 5 to 6 evenly spaced cuts around the cookie. 1. 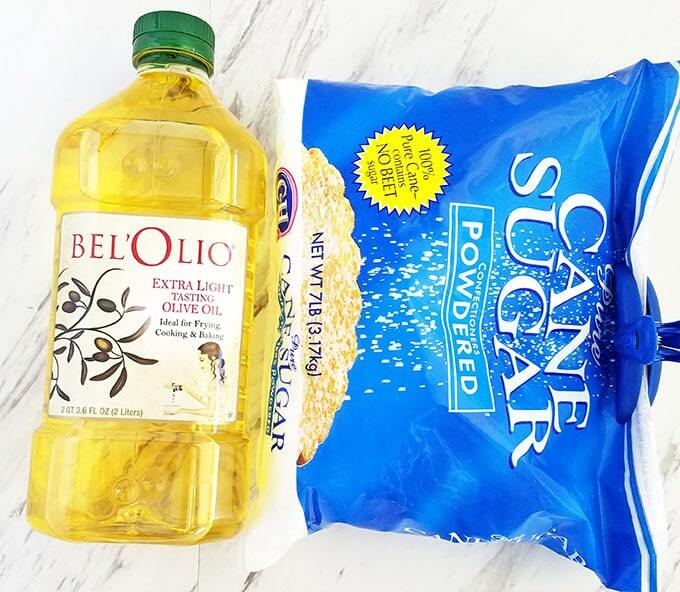 Fill ¼ (2 inches or 5 cm) medium pot with olive oil. On a medium setting, gradually heat to 300 F (140 C). 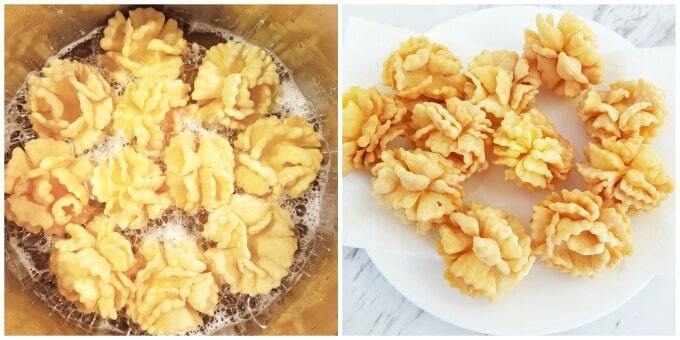 Carefully and gently drop 10 pom pom cookies, one at a time, into the pot of heated oil. Stir them constantly and very carefully (not to break off petals) until they are light golden brown. 2. Remove cookies from oil and place them onto a large plate lined with paper towels. Allow cookies to cool a bit little before drenching them in powdered sugar. 3. Add ¼ (35 g) powdered sugar into a gallon Zip Lock bag. 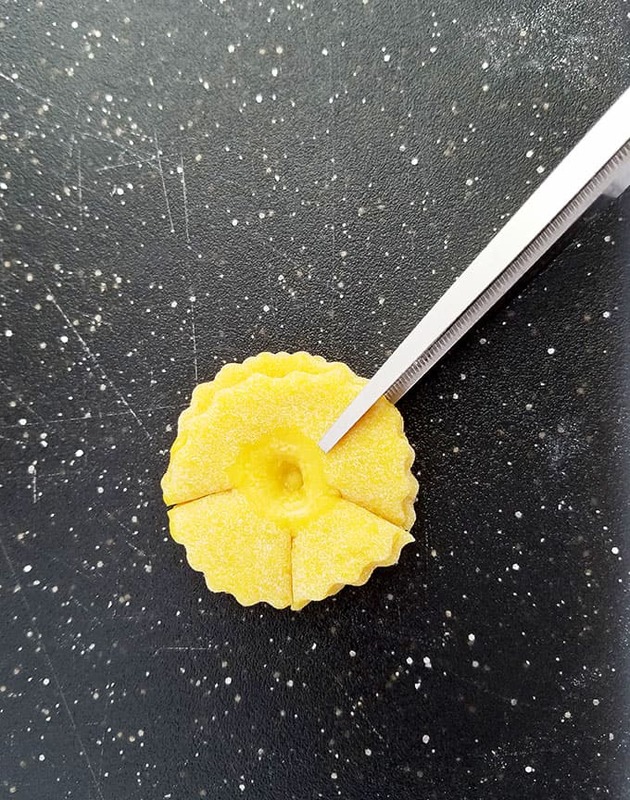 Place 10 pom pom cookies into the bag, seal the bag well, and carefully rotate the bag in a circular motion (about 5 times) or until cookies are fully coated. 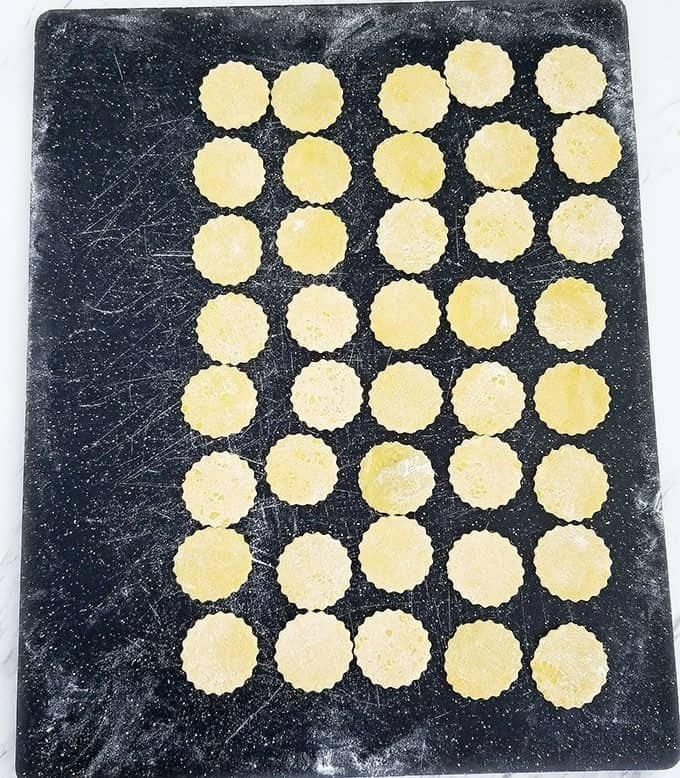 Repeat the same instructions with the remaining dough. Place cookies on a serving platter and enjoy! 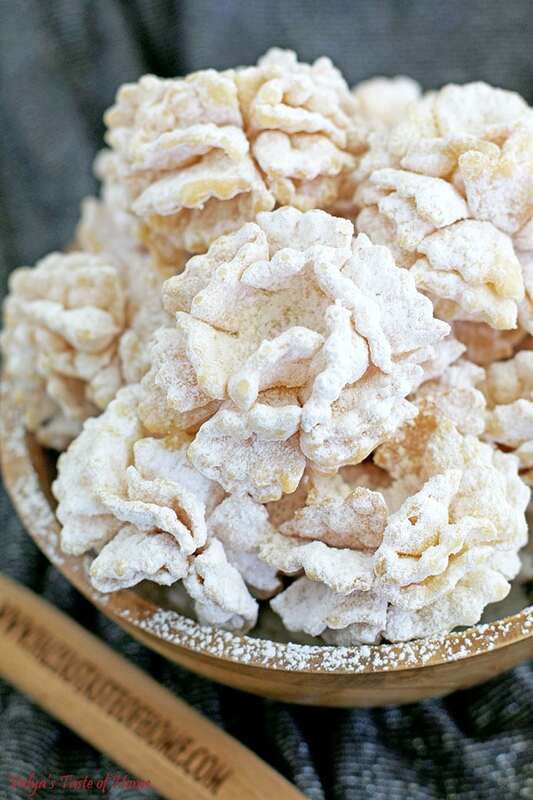 These Pom-Pom Cookies, traditionally known as “Hvorost” in Russian or “Hrustiki” in Ukraine. They are not only easy and delicious but also make a gorgeous dessert décor! You can make them for just about any occasion: holiday, graduation, birthday party, wedding, baby or bridal shower. Measure out and sift dry ingredients: flour, baking powder, and salt into a medium bowl. Beat eggs in a separate small bowl with a hand mixer on low for a minute or just until egg yolks combined with whites. Stir in vanilla extract. 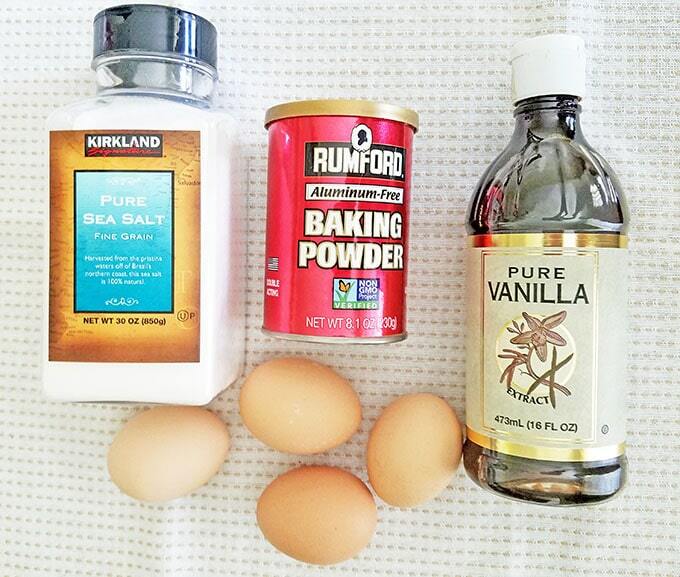 Add eggs to flour mixture and mix together with a silicon spatula. Dust work surface with flour and transfer the dough. Knead the dough into a ball, place into a bowl, cover with a lid and refrigerate the for 30 min to allow it to rest. Split the dough ball in half for easier rolling. Place chilled dough onto a working space dusted with flour. 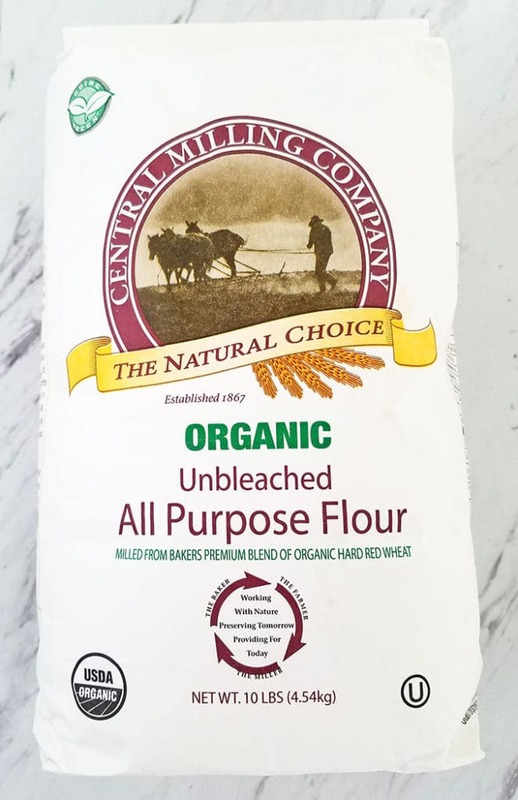 Flatten the dough into a disk and coat with flour. Roll the dough out working from the center out, coating with flour as necessary, until almost paper thin. 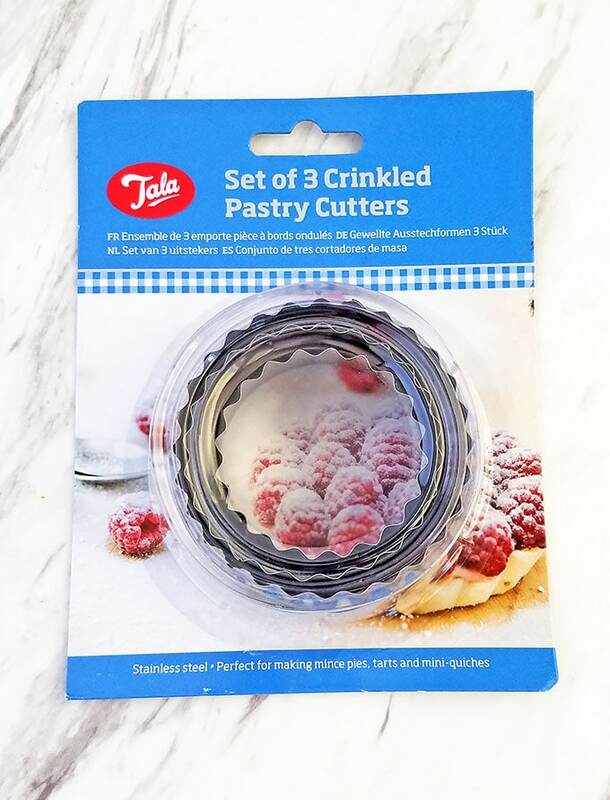 Cut out cookies with the dough cutters. Separate the cutouts from the remaining dough. Knead the excess dough into a ball and let it rest in the fridge again. Line cutouts in rows of 5 pieces. Dip a fingertip into water and tap the center of 4 cutouts. Stack them on top of each other so that a dry side is over a wet side, ending with a dry side on the top. Then firmly press down on the middle a finger (creating a small dip), to seal them together well. Repeat these instructions with the rest of the cutouts. 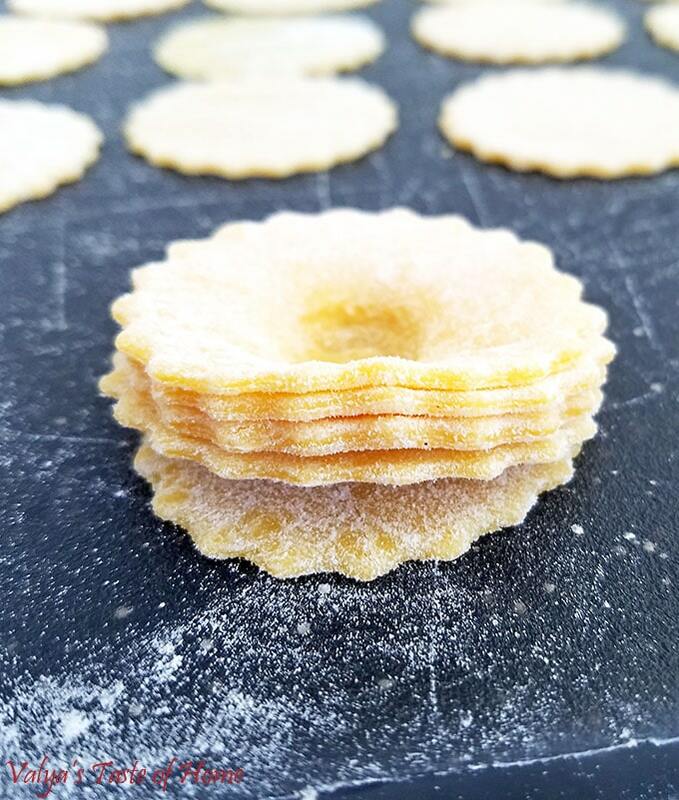 Using a pair of clean kitchen scissors, make 5 to 6 evenly spaced cuts around the cookie. Fill ¼ (2 inches or 5 cm) medium pot with olive oil. On a medium setting, gradually heat to 300 F (140 C). 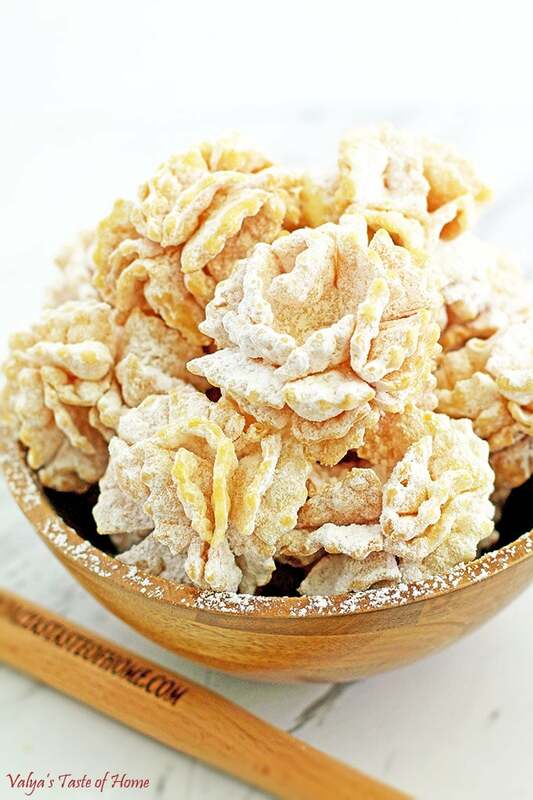 Carefully and gently drop 10 pom pom cookies, one at a time, into the pot of heated oil. Stir them constantly and very carefully (not to break off petals) until they are light golden brown. Remove cookies from oil and place them onto a large plate lined with paper towels. Allow cookies to cool a bit little before drenching them in powdered sugar. Add ¼ (35 g) powdered sugar into a gallon Zip Lock bag. 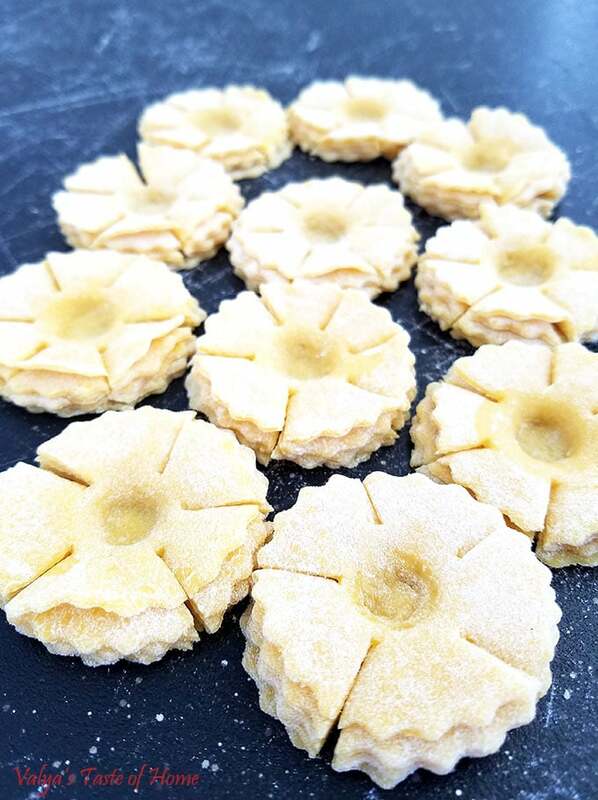 Place 10 pom pom cookies into the bag, seal the bag well, and carefully rotate the bag in a circular motion (about 5 times) or until cookies are fully coated. Repeat the same instructions with the remaining dough. 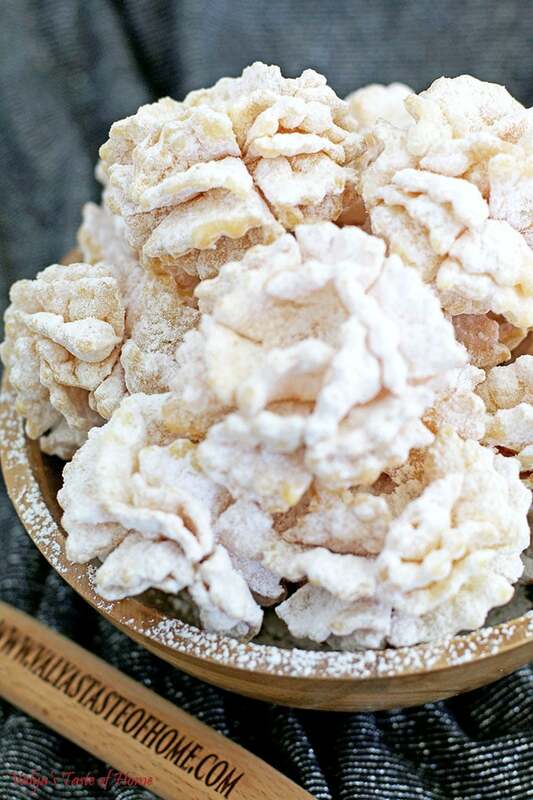 If you make this Pom-Pom Cookies Recipe, please share a picture with me on Snapchat, Facebook, Instagram or Pinterest. Tag with #valyastasteofhome. I’d love to see your creations! ? 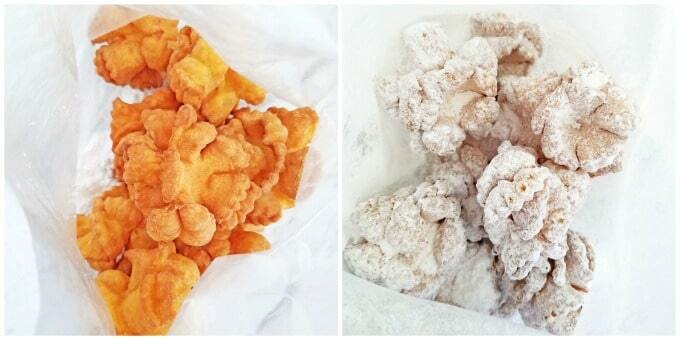 We have a similar recipe in Greece, with fried dough but without eggs , how cool is that? Hello! That’s awesome! The cookies are truly delicious. I have one more recipe of these kinds of cookies where eggs are not needed. I wonder if the recipe is the same. I will post that one as well eventually. Are these cookies good the next day? Or they are better same day? And how do you store them? They are pretty good the next day too, but best when fresh. Store them in plastic container with a lid a bit open. If powdered sugar melts a little dust it before serving. Enjoy! These are the cutest cookies I’ve ever seen!!! I cannot stop looking at them! I have to give this recipe a try. Thank you! 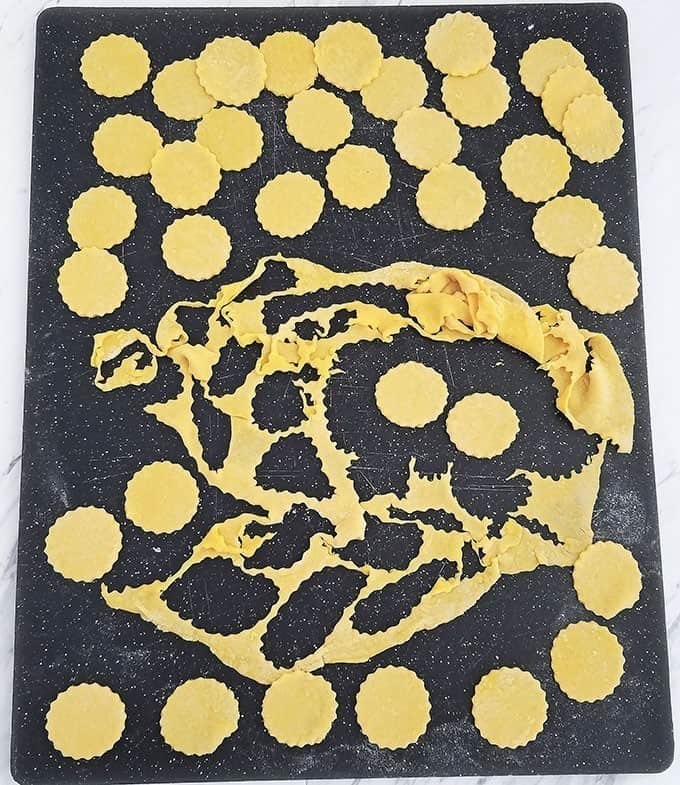 I think there is a similar Italian recipe like these. They look so good! I could use one on a cold rainy day like today with a hot cup of coffee! Dough turned out very hard and crumbly after incorporating with flour ? Oh, no! Did you measure out the flour correctly? Sounds like to much flour in the dough. It’s normal for the dough to be hard, but not crumbly. Remember this is “hrustiki” kind of dough, not yeast or biskvit. Give it another try. Practice makes perfect ?